While there are many benefits to eating papaya fruit, there are also important potential papaya enzyme side effects and warnings to be aware of. This is particularly the case with regards to the green unripe fruit, papaya seeds, papaya leaf and papain enzyme digestive supplements. Let’s have a look at seven of the most common side effects of papain papaya enzyme and in what situations and conditions it would be best to avoid using it. Green papaya latex, which is rich in the main papaya enzyme papain, has been traditionally used by various cultures in Asia to induce a miscarriage during pregnancy. For this purpose it was often applied directly to the uterus, but food forms such as green papaya salad, the seeds of papaya in the parasite killing papaya seed smoothie ahead, as well as supplements containing papain enzyme are best avoided by pregnant women. This warning does not extend to a fully ripe fresh fruit that are all yellow or orange with no green on it. These papaya fruit contain much lower levels of papain and are generally considered very healthy for pregnant women with their rich antioxidant and vitamin content and many other health benefits. Associated with the precautions of using papain when trying to become pregnant, papaya seeds, green papaya and other potent sources of papaya enzymes may interfere with a woman’s menstrual cycle if taken in large and regular doses. One research paper on the subject suggested two possible mechanisms for how papain or associated enzymes within papaya seeds and green papaya could have an effect on normal menstruation. According to the scientists, unripe papaya: “…contains the enzyme papain which suppresses progesterone, a hormone needed to prepare the uterus for conception and maintain pregnancy. Another possibility is that papain may break down a membrane vital to the development of the fetus”. Once again, fully ripe papaya would not contain enough enzymes to have a significant effect on the menstrual cycle or a woman’s ability to get pregnant. Some sources advise against using papaya enzymes, unripe papaya or even the ripe fruit during breast feeding, though no specific reasons or supporting research is given why. Interestingly, green papaya salads and soups are popular across Asia as a galactagogue, a substance that increases milk flow from the breast. To this end, eating the fruit while it is still green and full of papain enzyme is often recommended for breastfeeding women. Many Asian women also eat green papaya salad regularly, even when not breastfeeding, believing the papaya enzymes in it can lead to an increase in breast size over time. Along with their well known effects on the reproductive cycles of women, papaya seeds in particular can affect male fertility and have been traditionally used as a form of birth control for men in some Asian cultures. There’s a detailed look at using papaya seeds as a male contraceptive including supporting research here. Needless to say, a man trying to get his partner pregnant should avoid green papaya and papaya seeds. There are mixed reports from health resources regarding papaya enzyme and ulcers. On the one hand, people suffering from severe stomach ulcers are sometimes advised to avoid the fruit, particularly when it’s green, as well as any digestive enzymes with papain. On the other, eating papaya with its many nutrients and enzymes is often said to help prevent gastric ulcers and heal minor stomach problems. It may do this by both increasing the protective mucus secretions in the stomach and, due to its ability to speed up the breakdown of protein, lessening the amount of time hydrochloric acid sits in the stomach. While the occasional ripe fruit should not cause problems, talk to your doctor if you are being treated for a stomach ulcer and are thinking of using papaya enzymes with papain for digestion. As a natural alternative to pharmaceuticals, this superfood smoothie contains some excellent ingredients for healing ulcers and improving your overall digestive health. The papain enzyme may increase the blood thinning effects of medications such as Warfarin and other anticoagulants, including daily aspirin taken for this purpose. As such it is not recommended for use at the same time as a course of these drugs. It is also very important not to take papain supplements, green papaya or papaya seeds for several days before major surgery for the same reason. People with blood clotting disorders, such as thrombosis and hemophilia, are also advised to avoid papain and green papaya. In cases like these, and any of the above, it is best to discuss using papaya enzymes with a knowledgeable healthcare professional. 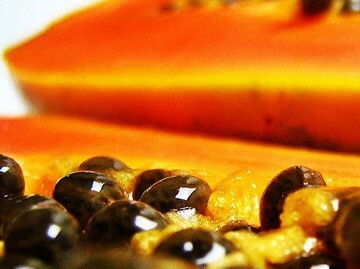 Papaya and especially the green fruit high in enzymes should be avoided by anyone with a latex allergy. Papaya allergies are rare, but people who experience allergic reactions to papaw may also have an adverse reaction to pineapples, avocados, bananas, figs, kiwi fruit, melons and possibly other tropical fruit as well and should use any of these with caution and watch for symptoms. Allergic reactions symptoms, while once again very uncommon, can include: swelling or itching of the face, lips, tongue and throat; rashes that appear shortly after consumption; dizziness; difficulty swallowing; and abdominal pain. There may be other side effects of a papaya or latex allergies so seek medical advice as soon as possible if you have any unusual reactions after eating any of the fruit listed above. For the vast majority of people, papaya and the enzymes from the unripe fruit are extremely beneficial and a very healthy addition to your diet. Effective green papaya digestive enzyme powder is available if you can’t get the fresh fruit all the time, but I’d still recommend looking out of it and trying it when you can. Papaya leaf is a natural treatment for dengue fever and malaria. It is particularly useful for dengue as there is currently no drug based treatment for the disease. It is also used as a cancer treatment in some natural therapies. While many people have found papaya leaf juice or tea effective, the papaya enzyme warnings and potential side effects on this page would be especially relevant with the potency of papaya leaf. Pregnant women in particularly should avoid all forms of papaya leaf and anyone being treated for ulcers or with blood thinning medication should consult their doctor before using it. 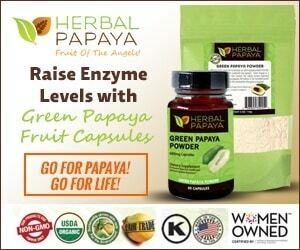 Do you have any experiences with using papaya enzyme that you’d like to share? I’d be interested to hear how it worked for you personally, both as a digestive aid and for other health improving purposes. Next is a look at the unusual benefits of papaya seeds, an even stronger source of papain and other enzymes and alkaloids, and how to use them to improve your liver health, intestinal environment and even as a treatment for parasites. question: Is its safe for someone with DIVERTICULOSIS to eat the papaya seeds? You’d have to check this with your doctor. The papain found in papaya seeds and unripe papaya is often recommended for diverticulosis, however papaya seeds contain other alkaloids and compounds that might not be recommended with this condition. Taking a papain supplement like this https://superfoodprofiles.com/go/green-papaya-fruit-powdered is probably a more effective option though I’d also get medical advice with this first and start at a small dosage. I was wondering if the Payapa enyzme pill will interact with Prilosec. I took one of the payapa and not too sure on it. – heart beat v v fast, chest very pain, sometimes graduate abdominal pain, sometimes nausea and drowsiness like headache. looks confused sometimes. Please advise what I could do to detoxin and help her with these pains. Many doctors (Dr specialised in eyes, gastro, heart. kidney n head, skin) could not cure her symptoms but narrowed down to say she need Geriatric which down in my heart tells me maybe the overdose of Papaya leaves extract juice. Please help to your best effort. Grateful. I wanted to thank you for your advice around papaya as parasitic treatment. I’d been suffering from about 18 months of cyclical GI upset, bloating, diarrhea, GI Inflammation from parasitic infections. Testing had identified blasto cystis, endolimax nana, and Dientamoeba Fragilis Trophozoites over that period at different times. I am not sure where I picked these up, but had traveled to Costa Rica about 6 months before the blasto-cystis diagnosis which was the first parasite to show up during testing almost 2 years ago. I had been through 4 separate rounds of a variety of antibiotics over that time: metronidazole, paromomycin, Alina, and was in the middle of my 2nd or 3rd round of paromomycin this Spring when I ran across your article about papaya seeds. Luckily I live where papayas are easily available and began taking a daily altered-version of your smoothie: papaya flesh, seeds (increased amounts over time), ground organic cloves, pineapple and kefir. Sometimes I add banana if those on hand needed to be used up so as not to spoil. In 2 days my diarrhea/symptoms stopped and I haven’t had another recurrence since, now 3 months later (fingers crossed.) Additionally I took a daily oregano oil capsule supplement as directed. I drink the smoothly almost daily as I’ve grown accustomed to it as part of my breakfast. Shortly after starting the smoothie, I had an allergic reaction (rash) to the antibiotic, so had to stop the medication. The only treatment I continued with was the papaya seed smoothie and I feel so much better. I encourage others to try this treatment and follow up with good probiotics for a long as possible afterwards. Thanks again! Can I take the papaya extract while pregnant….I am currently 30 weeks pregnant with a low platelet count. Thanks! This isn’t recommended for pregnant women unfortunately. The article https://superfoodprofiles.com/papaya-enzyme-side-effects-warnings explains why but papaya enzymes as specifically contrindicated during pregnancy. My friend and I walked on an Island and took a unripe papaya. My friend said Its Good for the skin and I applied some of the milk on my skin. Not knowing that there is Latex in it. I am allergic to Latex and it coursed a skin reaction. First red and now a bit more brown. Its two weeks back and I hope it will fade at one point. It basically burned my skin. Do you have any additional information on what happened there chemically or medically in the skin?Did it destroy the melanin? What could help to treat it? It wasn’t itching or something. Hi Al and thank you for your detailed and positive comments. I’m glad to hear the papaya seed smoothie worked so well for you, particularly for blastocystis, endolimax nana, and Dientamoeba Fragilis Trophozoites which there is far less natural treatment information on versus parasitic worms. It would be worth repeating the treatment occasionally as per the instructions in https://superfoodprofiles.com/papaya-seeds-parasites , even if you feel much better, to ensure you’ve fully dealt with these parasites. If the dengue fever symptoms of low platelet count are not apparent it would be best to stop using the papaya leaf treatment. Beyond that it’s important that she be treated by a healthcare professional who can see and diagnose her directly. As a general rule take natural treatments well away from medications. Also consult your doctor as to possible interactions between Prilosec and papain enzyme. Is it good for somebody having hepatitis B virus to take papaya seed? Continue taking any medications from your doctor well away from papaya seeds. Hello I was wondering does a ripe papaya help you get rid of parasites and worms ,without the seeds.Reason being I’m barely in my early stage of pregnancy . Is it safe to eat still and if so will it be as effective or can I combine it with anything else. Unfortunately only the seeds have both the alkaloids and high levels of papain that make the papaya seed smoothie work. Unripe papaya has papain as well but both should be avoided by pregnant women. Papaya enzymes can help if the problem is related to poor protein digestion. I’d also recommend ginger tea for acid reflux https://flatulencecures.com/ginger-tea-benefits-digestion/ and looking into the other natural remedies and causes of acid reflux on that site. I also had a recurrent intestinal worm problem every summer for a few years and the medication Lomper wasn’t effective. I found this papaya smoothie while pregnant and weary of taking lomper again. So I did 3 weeks of daily smoothies in the mornings. I omitted the yogurt, pumpkin seeds, and coconut milk and oil because they made me nauseous. .. too many ingredients. Anyway immediately the nightly symptoms went away… and never came back.